I have my PC plugged into my TV, so that I can use my actual Wii sensor bar, instead of buying a wireless one. I have used it before, plenty of times, and it has worked wonders. Now though, after having to re-install Dolphin, it simply won't work. I have tried in a dark light situation, and I know it works with the wiimotes I have, because I can see it move while on the Wii input on my TV. On the emulator though, nothing appears. I have tried on TP, Animal Crossing, and Pikmin NPC, which all have worked beforehand with my experience. Edit: Also, the sensor bar is plugged into a Wii U, but that shouldn't make a difference should it? It's what i used it on before. Did you set it to Real Wiimote and then connect a wiimote to dolphin via bluetooth? (07-28-2013, 12:31 PM)MaJoR Wrote: Did you set it to Real Wiimote and then connect a wiimote to dolphin via bluetooth? Is the Wii U on while you're playing Dolphin games? That's necessary, otherwise the sensor bar's off. (07-28-2013, 01:49 PM)pauldacheez Wrote: Is the Wii U on while you're playing Dolphin games? That's necessary, otherwise the sensor bar's off. Do the buttons work on the wiimote? It's possible you turned on the Wii U, then tried to connect the wiimote, thus connecting it to the Wii U instead of your PC. Wii remotes have to be connected to Dolphin before the Wii or Wii U powering the sensor bar is turned on. (07-28-2013, 03:18 PM)MaJoR Wrote: Do the buttons work on the wiimote? It's possible you turned on the Wii U, then tried to connect the wiimote, thus connecting it to the Wii U instead of your PC. Wii remotes have to be connected to Dolphin before the Wii or Wii U powering the sensor bar is turned on. Alright, I have a little exercise for you to do. 1. Connect a real wiimote to Dolphin, make sure that it shakes. 2. 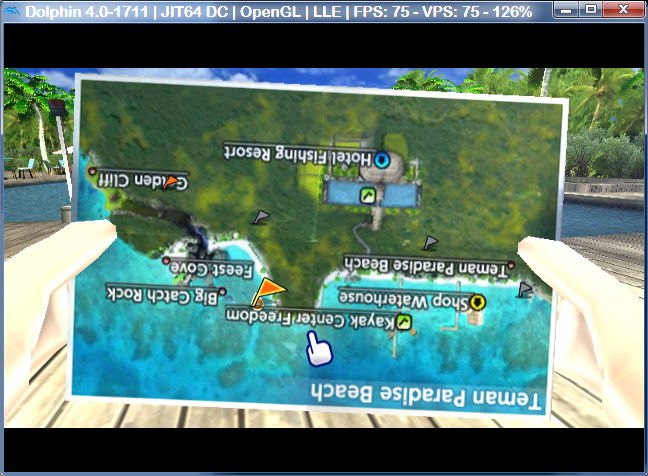 Start a Wii game in Dolphin, and then press home to bring up the menu where the pointer can be seen. 3. Turn on the Wii U. 4. Point the wiimote at the sensor bar and see if the pointer appears. 5. If it doesn't appear, take a picture of the sensor bar with a camera (without IR filter, just about every camera minus the last few iPhones). If there are lights on the sensor bar then it is on, otherwise, the sensor bar is off. 6. If it is on and you still don't seem to be getting anything on the pointer, try to use the wiimote further back from the sensor bar, then see how close you can get while it is still usable. This will pretty much tackle every possibility and allow us to isolate the problem. So do all of the steps, and report how each stage went.